NOTE: If not paying for both weekends but wish to crop during week it is $25 per day to crop. Join us for a weekend of uninterrupted album-making time! Crop with a full view of the Atlantic Ocean in the crop room and sleeping rooms.. Relax at an oceanfront hotel with your own private balcony where you can step out and breathe in the crisp ocean air. In addition to enjoying the spectacular view overlooking the sparkling Atlantic Ocean and white sands of Virginia's finest beaches. A fitness room to pamper you if you can tear yourself away from cropping! 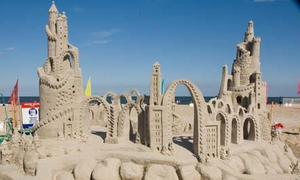 Create a Sandcastle Adventure you will always remember! Reward yourself with uninterrupted time to work on your albums. Crop around the clock if you like, keeping your supplies set up the entire time! REGULAR Fee Includes: Thursday, Friday, Saturday, and Sunday 6' table space in the cropping room; hotel stay for Thurs, Friday and Saturday nights based on 2 per room; dinner on Friday evening; FULL HOT breakfast and lunch on Saturday; FULL HOT breakfast on Sunday. Access to on site vendors, and prizes! There will be door prizes given away during the weekend including 3 grand prizes.